Find My Workspace lists over 95% of the business centres market in Wokingham. Simply click Request Quote to check pricing for one office, or Add to Basket for multiple offices. This bright and airy building, located in the heart of the Thames valley, is available now with refurbished office space that has been finished to an excellent standard. The space is priced at £25 per square foot inclusive of service costs but excluding utility bills and business rates. 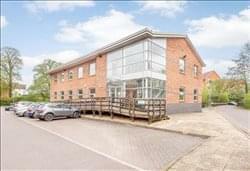 The offices are spread over two storeys on a secure site that also offers ample car parking spaces. The space features air conditioning, suspended ceilings with recessed lighting and raised floors as standard. Tenants have access to the kitchen facilities that are on-site. The property boasts a multitude of windows that flood the space with great natural lighting.